This is the first article I have posted from a magazine called, simply, Electronics. It is very different from all the other vintage electronics magazines I have used in the past. Electronics is much more focused on military, space, and fundamental research. New issues were published bi-weekly by McGraw−Hill from 1930 until 1988. About half the editions (this is not one of them) had two to three times as many pages as the other half, with most of the extra pages being advertisements. The publishers must have made a fortune on advertising revenue. My guess is that the vast majority of the companies appearing in the early 1960s issues I bought on eBay do not exist anymore, having either gone out of business or having been acquired by bigger companies. If you were around in the era, you will probably see every company you remember represented. The article presents a very interesting antenna concept. Someone had his thinking cap on real tight when dreaming up the radio wave focusing scheme described. A "high speed computer" was used for simulations prior to building the prototype. Its key objective was to drastically reduce the amount of acreage needed to obtain performance akin to rhombic layouts. The Federal Aviation Administration (FAA) funded the project citing a need for reliably receiving intercontinental air traffic control information. Readily available satellite communications had not yet been established at the time - but very soon thereafter would be, which is probably why we don't see much about this antenna today. Comparison of wire-grid antenna and part of the 1,100-acre antenna farm formerly required. Diamond patterns outlined by poles show individual rhombic antennas. By G. V. Rodgers, Chief, Data Transfer Section, Federal Aviation Agency, Washington 25, D. C.
Radical departure from conventional antenna technology is demonstrated in the design of a high-frequency lens antenna that consists of two circular grids, suspended one over the other, and surrounded by a radial wire horn. Electromagnetic waves are intercepted by the horn, concentrated in a vertical direction, and transferred to the lens as depicted in Fig. 1. Refraction within the lens causes the wave front to bend and converge at a focal point on the diametrically-opposite side, where a transmission-line coupler is located. Up to thirty-six couplers may be installed in the lens to provide coverage in as many different directions. Outputs from the feeds can also be combined to provide a steerable beam for full azimuthal coverage. 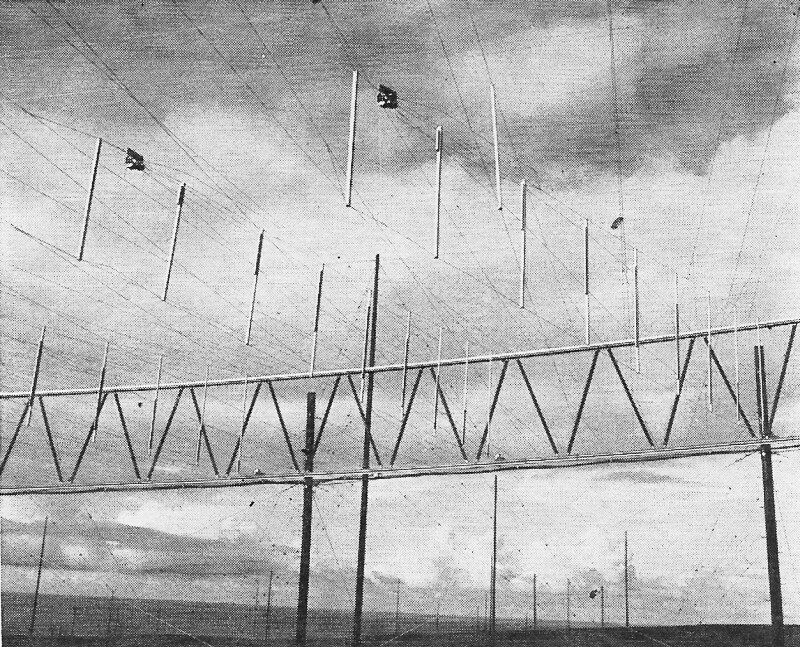 Developed for the Federal Aviation Agency by R. L. Tanner of TRG-West, the wire-grid lens antenna is located at the International Flight Service Receiver Station on the island of Molokai, Hawaii. Signals transmitted from Anchorage, San Francisco, Sidney, Tokyo, and other Pacific Ocean points are received and relayed to the FAA Air Traffic Control Center near Honolulu. Rhombics previously installed to receive these transmissions require about 1,100-acres of land, whereas the lens requires only 850 feet for simultaneous reception of signals over operational circuits from seven directions between 3 Mc and 30 Mc. Poles that hold some of the rhombics, and the wire-grid lens that is intended to replace them appear in the lead photo. The line from the lens to the buildings contains feedlines. Fig. 1A - Concentration of wave energy by wire-grid lens shown in artist's drawing. Design - Lens techniques, based upon optical theory developed by the late R. K. Luneburg1 have been applied in the design of relatively small microwave and UHF antennas. In these antennas, wave focusing is generally accomplished with a dielectric foam material with a refractive index that is made to vary over the cross section in a prescribed fashion. The Luneburg lens may be constructed in spherical or disc form; the concept has not previously been extended to the lower frequencies due to the impracticability of using solid dielectric materials in large structures. The wire-grid lens antenna2 has properties which resemble the disc-type Luneburg lens. The solid dielectric is eliminated and the focusing properties of the lens are achieved by varying the spacing between a pair of wire grids in a systematic manner. Index of refraction is made to vary as a parabolic function across the lens aperture, and the velocity of propagation varies between the free space value at the circumference of the grids, to approximately 70% of the free-space value at the center of the grids. This variation in velocity of propagation of a wave entering the lens may be explained as follows. Operation - At the edges of the lens where the spacing between the grids is large relative to the mesh size, the grids simulate a pair of metal plates and the wave in this region propagates at nearly the speed of light. At the center of the lens, where the spacing between the grids is small compared to the mesh size, the grids act as a network of interconnected open-wire transmission lines and the wave in this region propagates at a slower rate, that has been shown2 to be 1/√2 times the velocity of light. The end result is that the plane wave front intercepted by the lens is transformed into a curved wave front, with rays converging at a focal point on the opposite side. The properties of the lens are independent of frequency, as long as the mesh size is small compared to a wavelength, at the highest operating frequency. Since the waves traveling between the grids have electric fields that are generally vertical, the antenna is essentially vertically polarized. Fig. 1B - Transmission-line coupler assembly installed in the lens. Radiation efficiency at lower frequencies is preserved by the electromagnetic horn attached to the grid. This horn provides proper impedance match between free space and the lens, and also increases vertical directivity. Construction - The wires that comprise the grids are attached to rings fabricated from specially extruded aluminum sections. Both upper and lower grids are identical; each of the rings is 600 ft. in diameter with grid wires spaced to form squares 5 ft. on a side. The mesh is uniform from the center of the lens to a distance of 37-1/2 ft. from the outer edge, where satellite wires taper away from each of the major grid wires to form a mesh of 2-1/2 ft. squares at the periphery of the lens. The two grid rings are attached together by diagonal-web members of impregnated hardwood to form a truss. The spacing between the upper and lower grids is 12 ft. at the rings and 6-1/2 inches at the center of the lens. Proper spacing between the grids is maintained by insulating spacers. The horn is composed of wires which extend radially from the lens rings to bridle cables attached to the 24 outer poles, which average 94 ft. in height. There are 504 radial wires, 145 ft. long in the upper-horn curtain and an equal number of wires, 130 ft. long in the lower curtain. Short lengths of wire are connected between the radial wires out to 1/5 of their length from the lens rings. 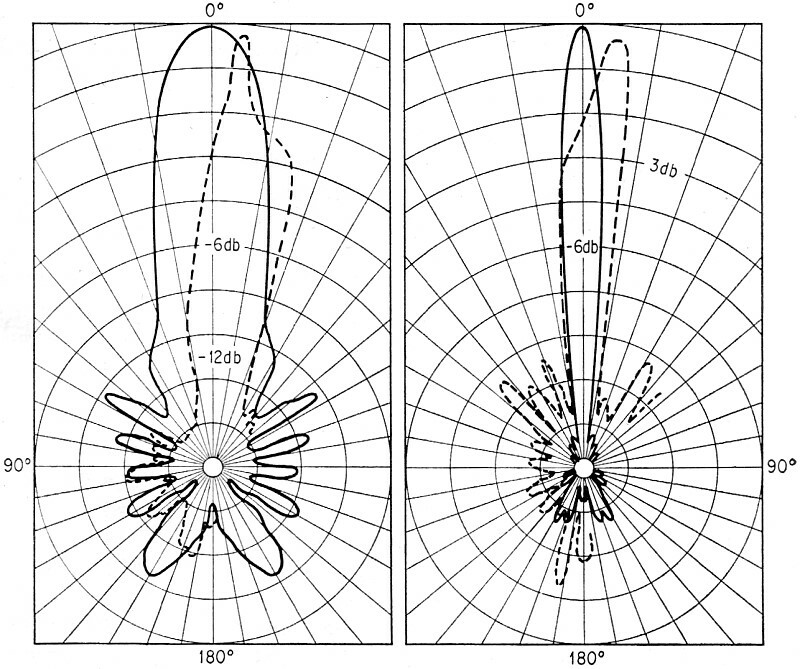 These wires are necessary to provide paths for circumferential currents produced by the higher order propagation modes which would otherwise be strongly excited, due to the discontinuity, and contribute to side and back lobe radiation. The upper-horn curtain is attached to the outer poles at points which are a constant height above the plane of the lens. The lower-horn curtain is attached to the poles at points seven feet above the ground. The average angle between the horn curtains is 25 degrees. Line Coupler - The device used to couple the signal from the lens to the receiver transmission line, is a modified ramp feed that evolved from a comprehensive series of experiments and calculations. In simplified form, the ramp feed consists essentially of one or more conductors extending diagonally between the lower and upper grids of the lens. Since the ramp has vertical current components along its slope, it may be considered as a series of vertical current elements which couple to the electric fields of the waves traveling between the grids. The array pattern is a cardioid with its null in the rearward direction. 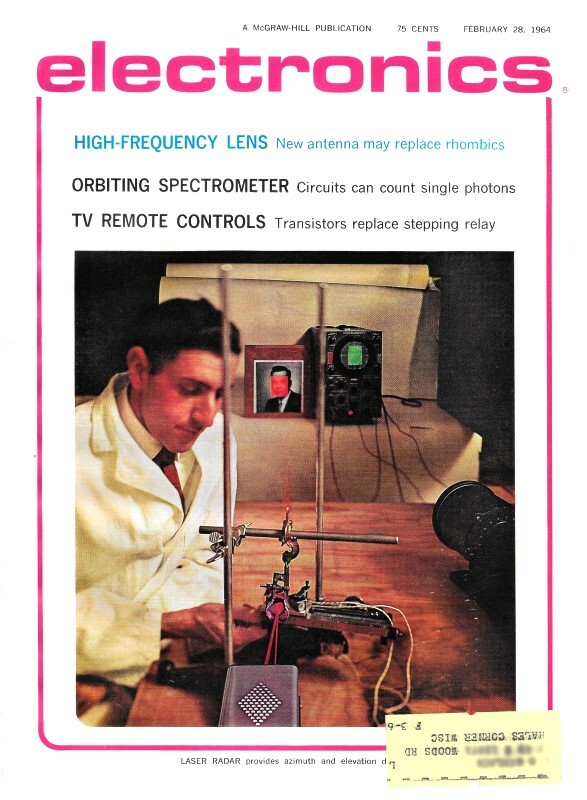 The antenna described in this article uses lens techniques based upon optical theory developed by the late R. K. Luneburg. While the Luneburg lens has been used extensively at microwave frequencies, this array is the first to extend lens principals to the 3-Mc to 30-Mc range. Moreover, the antenna described does the job formerly assigned to 1,100 acres worth of rhombics, yet requires only a fraction of the geographical area necessary for rhombics with equivalent coverage. The actual feeds extend 75ft. into the lens as shown in Fig. 1B. Each feed consists of a pair of wires spread apart along their lengths to provide a constant impedance. Maximum coupling between the lens and the feed occurs when the phase velocity along the feed is slightly slower than that of the lens. This wave slowing was accomplished by the addition of capacitive loading in the form of aluminum plates connected across the wires of the ramp. The phase velocity along the feed is slowed from the free space velocity by the ratio of 1.2:1. Broad banding of the feed is accomplished with a constant-resistance network in which R = √L/C. The current in the end elements is fed in the proper phase relationship with respect to the ramp through phase-inverting transformers connected to each of the current elements. The coupler is constructed with two identical feeds spaced 30-ft. apart at the circumference of the lens. The pattern characteristics of the feed are such that less of the lens aperture is illuminated at the higher frequencies, making beam width essentially constant at frequencies above 10 Mc. Performance - Results of preliminary tests indicate that the antenna is performing in accordance with design predictions. Impedance match to the transmission line surpassed expectations; the highest standing wave ratio measured for any of the couplers over the entire frequency band is less than 2:1 at the antenna coupler output. The beams are well defined with a minimum of side and back lobe radiation. Fig. 2 - Polar patterns showing calculated (solid) and measured (broken) plots of the array. Patterns were calculated for 4.0 Mc and 30 Mc, while measurements were taken at 3.8 Mc and 25 Mc. Throughout the development cycle, two valuable tools were employed to optimize design parameters. The first was a 1/ 40th scale model of the lens and horn structure, and the second, a high-speed digital computer equipped with an automatic pattern plotter. 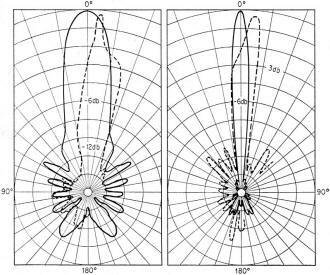 Analytical methods were used to derive the differential equations describing wave propagation in the lens and the feeds. These equations were solved directly by the computer, while the scale model was used for experimentation to improve the feed and coupling methods. A complete set of calculated patterns was produced by the computer. Example of calculated patterns for frequencies near both ends of the band are shown in the solid curves of Fig.2. As generally recognized, it is extremely difficult to obtain full-scale radiation patterns of antennas operating in the HF range. This being the case, the results of calculations or measurements using scale models, are usually accepted as final results. Since there is such widespread interest in application of the wire-grid lens to communications and other purposes, full-scale pattern measurements are mandatory. As an initial approach to this objective, a set of patterns measurements was made with a test transmitter and antenna mounted on a vehicle. 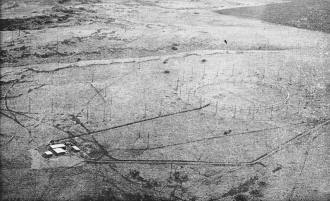 The receiver site on Molokai was surrounded by a network of roads, making it possible to define a path sufficiently distant from the antenna to be in the far field of radiation. 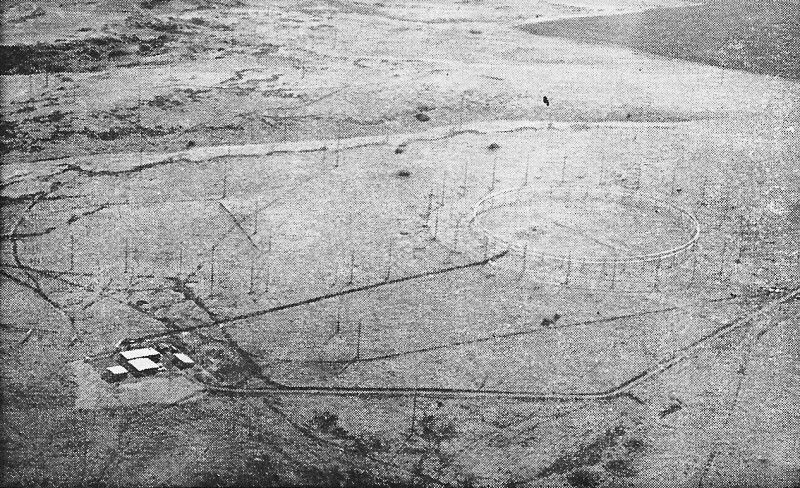 A total of 43 test stations were established along this path and their azimuthal directions from the antenna were defined with reasonable precision. By moving the vehicle from one test station to another, it was possible to define the main beam of one feed and the side and back lobe radiation from another. The results were pieced together to form fairly complete patterns. Examples of the actual patterns obtained by this method are shown in the broken curves of Fig. 2. Irregularities in measured radiation patterns are attributable to two causes. First, the contours of the terrain on the island and the geography of the roads available for running the vehicle containing the test transmitter were such that it was impossible to obtain line-of-sight measurements. 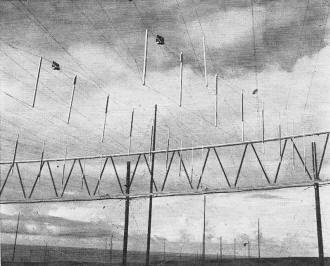 The patterns taken, therefore, represented signal fringing over the edge of hills between the antenna and the transmitter. Second, the antenna used as a reference was found to be far from omni-directional. Actually, two antennas were used for this purpose; a tuned whip with the grids of the lens acting as a counter poise, and a huge bi-conical composed of the upper and lower lens and horn segments. Neither of these reference antennas was omni-directional, but it appeared from the data that the bi-conical feed to the lens provided the most uniform reference. This antenna was used to plot the data shown in Fig. 2. Preliminary operational tests of the lens antenna compared to the rhombics indicate that although the signal level received via the lens was lower than that received from the rhombics, the improved signal-to-noise ratio resulted in increased readability at lower signal levels. The Federal Aviation Agency is preparing for a comprehensive evaluation of the wire-grid lens antenna with support from the U. S. Army Electronic Research and Development Laboratory at Fort Monmouth and the U. S. Navy. This program, will include flight-test measurements of the full-scale radiation patterns and operational tests to determine performance.